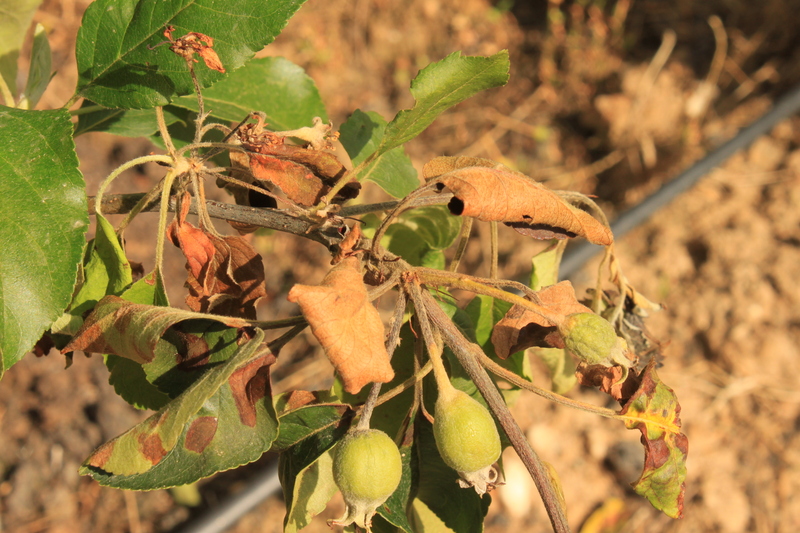 In my 35 years as a Farm Advisor, 2015 is the worst year I have experienced for fire blight. Normally we don’t even see it. In a bad year it attacks very susceptible Asian pears, causes a few strikes on susceptible European pears like Bartlett, but causes almost no problems on most apple varieties. This year, it devastated Asian pear orchards, wiped out European pears, severely attacked apple trees, and even caused extensive damage to ornamental, street-tree pears that are resistant to it. It caught some commercial growers by surprise. The disease is caused by a bacteria called Erwinia amylovera. It primarily effects Apples (Malus), Pears (Pyrus), and Quince (Cydonia), but it can also attack Hawthorn (Crataegus), Loquat (Eriobotria), Pyracantha and a few others. It has been really bad this year for two reasons. Number one is that we had a winter with very little effective chilling. This caused many tree species to leaf out abnormally and to flower sporadically over months instead of a few weeks. In fact it was common on apple and pear trees to see large fruit and flowering at the same time even into mid-summer. Prolonged bloom is bad because most fire blight infections get into the tree via the blossoms. Consequently, the longer the bloom period the more susceptible the trees are to infection. The second reason is that we had several, abnormal, light, rainfall periods accompanied by high humidity and warm temperatures this spring and early summer. Fire blight flourishes under wet conditions with temperatures in the 60 (oF) range. 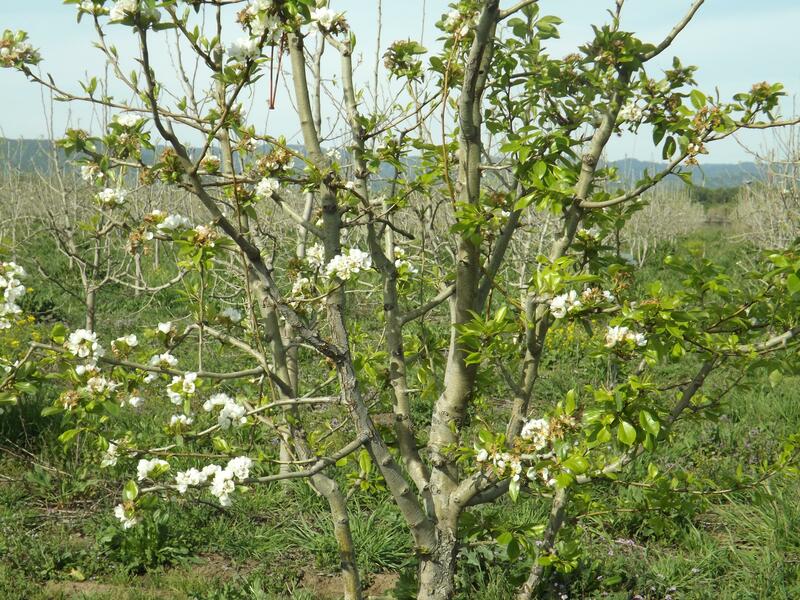 Commercial apple and pear farmers have traditionally used protective copper or antibiotic (bacteriacide) sprays during bloom followed by daily pruning cuts to immediately take out strikes that had gotten into the blossom spurs or new shoots. This year for the first time, organic growers were no longer able to use traditional antibiotics, but fortunately there are several alternative, organically acceptable products that work quite well – just as well as the old antibiotics or copper sprays. 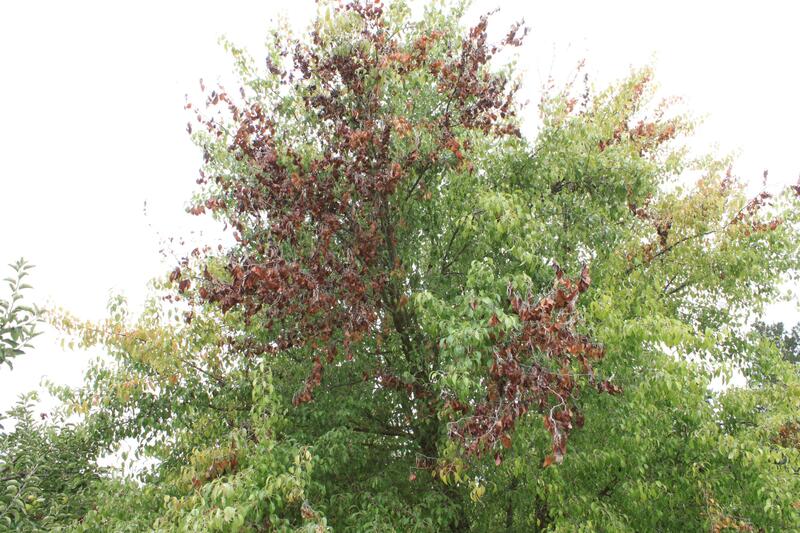 For home fruit gardeners or those who have ornamental pear trees that they feel need protection, the most practical control is to prune out overwintering cankers and then spray the trees with a copper fungicide as the first blossoms come out. This winter when the trees are dormant, the branches and trunks should be checked carefully for sunken bark cankers where the bacteria overwinters. Those branches should be removed or the cankers should be cut out down to clean wood and sprayed with a copper fungicide. Next spring – at bud break (green tip), apply one of the fixed copper sprays for sanitation. Copper sprays have been shown to reduce the bacteria by at least half. At the early bloom stage apply a biological protectant like ‘Blossom Protect’, which is a yeast that colonizes flowers during bloom and protects them. 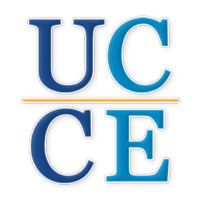 Other effective products include: “Bloomtime Biological’, ‘Serenade Optima’, ‘Blight Ban 506’, which are antagonistic bacteria, or copper products such as ’Cueva’, ‘Kocide’, ‘Nordox’, ‘COCS’, ‘Badge’, Bordeaux, etc. when weather conditions are correct. Several protective sprays may be necessary if wet weather persists. Care must be taken to avoid products that cause fruit russeting. CAUTION: Remember to check the product label. Labels change. The label is the document that governs the legal use of the product. Also, check to see if the product is acceptable for organic certification, if you are an organic grower. 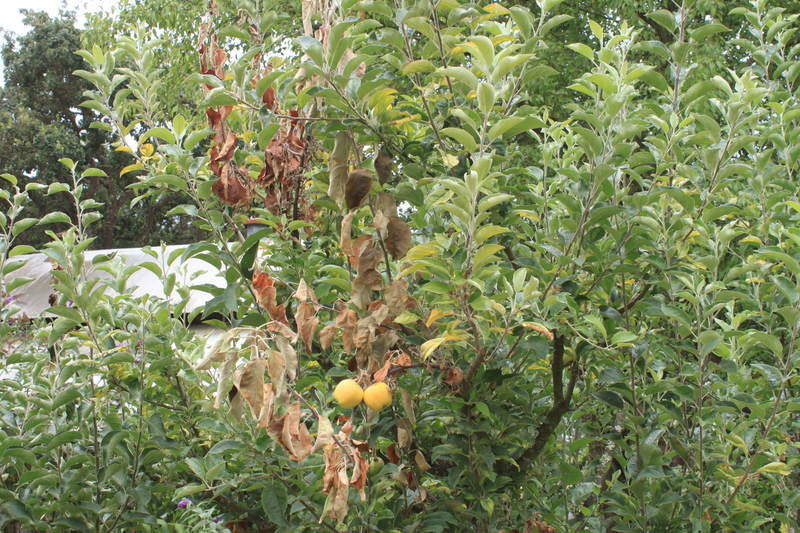 Brown and wilted leaves and shoots on an apple tree that has progressed into a large branch. 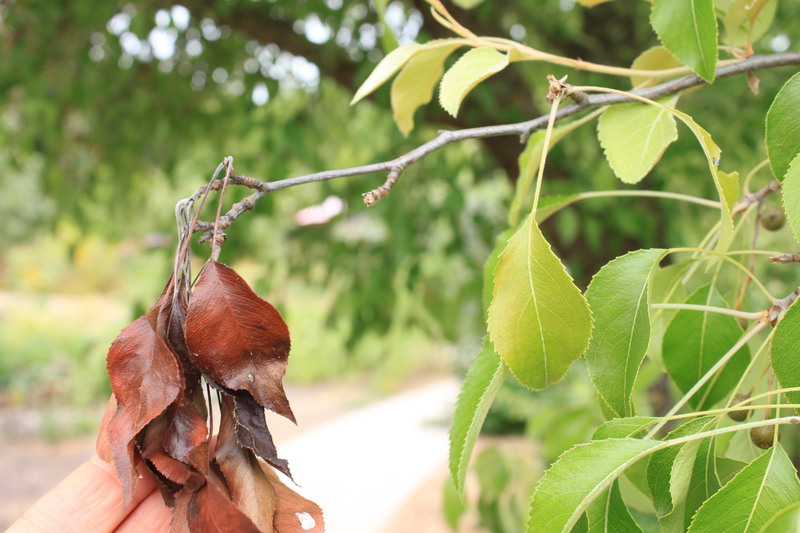 Brown leaves and wilted stem tissue showing the typical symptoms of fire blight on pear. Dead branches from ornamental pear that is normally highly resistant to fire blight. The dead branches will have to be pruned out. Pear tree showing uneven leafing out and flowering due to inadequate winter chilling.